I hope you all are having a peaceful holiday today with family and friends. Another year has flown by and 2011 is right around the corner! It's hard to believe this was the fourth year of being my own boss and running my own business. I've met some really great people and gotten to work on some fun projects over this past year. Last summer I met Willi Galloway from one of my favorite gardening/food blogs DigginFood. She asked me I was interested in partnering with her on a project we could both share on our blogs—desktop wallpapers with a calendar for each month of 2011. I happily agreed and starting thinking about themes, imagery and eventually landed on the idea of modern homesteading. It works with the things she blogs about plus I thought chickens and goats would be fun to draw. So here is my gift to you, my loyal blog readers (hi Dad) and anyone looking to brighten their desktop with some colorful images. 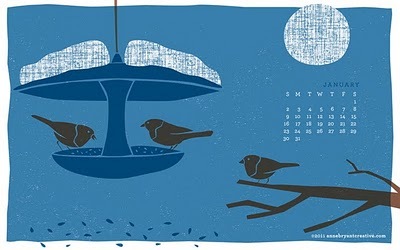 January starts off with little birds at the feeder which I enjoy seeing in my own backyard every day. There are three sizes to choose from—just select which one fits your monitor and click on the link to automatically download the file. I decided to take the images I created for the desktop wallpaper and create a set of 12 notecards with envelopes and stickers. I'm really happy with how they turned out! If you would like to purchase a set which comes in a cute cotton drawstring bag, please visit my Etsy shop.